La Madonna de Bogota by Raphael; as Santiago Martinez Delgado discover it. The Madonna of Bogota is a painting of the Madonna and Child, redisovered in Bogotá Colombia in 1938, that has been attributed to Raphael. In 1938 Mrs. Maria Mendoza a friend of Master Santiago Martinez Delgado invited him and his wife Leonor Concha de Martinez, to her home in Bogotá. Mrs. Mendoza had with her a painting she thought to be by Gregorio Vazquez Arce y Ceballos, a well-known Colombian artist about whom Martinez Delgado had written a book. Based on the fact that Martinez was considered an expert in Art History and Arce y Ceballos, she asked him to attribute the piece. As soon as Master Martinez laid eyes on the painting he immediately knew that it was either by Raphael Sanzio or by someone in his school. The piece was in very poor condition, split in two and kept together by a piece of wire. Master Martinez took the painting for further study and research, and after taking x-rays and other steps he was convinced that it was, in fact, an original Raphael. When the rumor about the painting reached the press, it quickly started a heated debate; some dismissed it, including the El Tiempo daily that argued that it was a copy of a Raphael piece currently at the Museo del Prado. Soon the Master called for a symposium at the municipal theater to discuss the matter. The event was attended by well-known Colombian experts like Enrique Uribe White, Antonio Bergmann, Domingo Otero and Ines Acevedo Biester. Martinez explained the provenance and the scientific work done on the work making an irrefutable point. 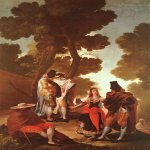 He also revealed that the painting had been brought to Colombia by Caballero Góngora; furthermore, Mr. Enrique Restrepo proved that although it was similar to the one in El Prado it was different in many aspects. 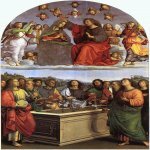 The most important of these aspects is that the painting in Madrid's El Escorial Chapel had been there for a long time making it impossible to copy during the 1500s. Finally in 1939 Martinez brought the painting to New York's Metropolitan Museum and to Columbia University it was studied by Daniel Catton, Rich A. Sweet, Ruber H. Clark, Leo A. Marzolo, Adolfo Venturiy, and Wilhelm Valentiner, who was in New York for the International Fair. In June 1939 the painting was confirmed as an original Raphael and entered named the Madonna of Bogota. The piece was then taken to the Chicago Art Institute to be restored. 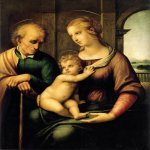 Joaquin Piñeros Corpas confirmed it in Colombia on an article in El Tiempo: “Confirmado: Madonna De Bogota Por Rafael Sanzio Urbino.” Many US papers acclaimed Master Martinez for his discovery. Nowadays, the abouts of the painting are unknown, but it's possibly being kept in a bank vault in New York City.